Flower Form: rose-pink star-shaped flowers appear atop short, upright stems. 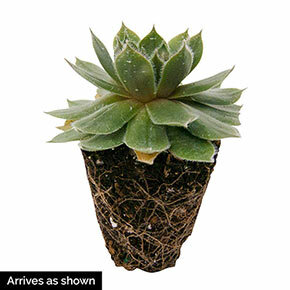 Foliage Type: Fine white threads crisscross between leaves tips giving it the look of cobwebs. Rosette are pointy 1" wide blue-green leaves. The color can vary from season to season. 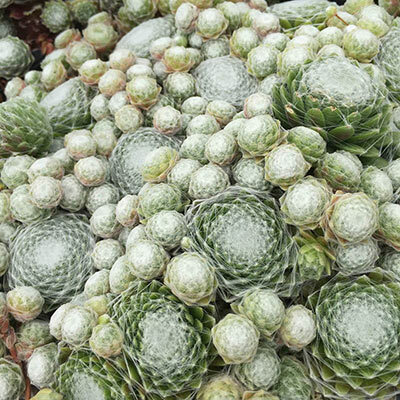 Additional Information: Sempervivum which is one large rosette "hen" sprouts smaller rosettes called "chicks" As the plant age the "hen" will die out and be replaced with "chicks"